We’ve released an update for Photo Frames Free and Pro improving the social sharing functionality. Photo Frames allows you take, frame & share photos within one application. You can share your framed photos with your friends via Facebook, Twitter, BBM™ and email. With 10 free frames there’s plenty to choose from, for the ones that want even more frames and options, for just $0.99 you can upgrade to the Pro version. the Pro version comes with an additional 17 frames and allows you to customize options to your liking. Get the latest version of Photo Frames on BlackBerry App World™. 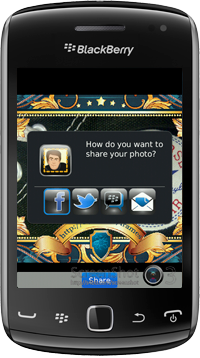 Photo Frames Free and Pro is compatible with all BlackBerry® Smartphones running OS 7.0 and up.